LitSite Alaska has designed this section for Alaskan educators teaching Seth Kantner's award-winning novel Ordinary Wolves. The goal of this site is to provide an array of educational material to supplement instruction of this coming-of-age novel of identity and culture. 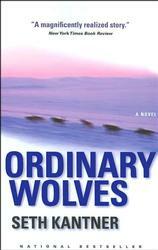 Chapter-by-chapter discussion questions for teachers teaching Seth Kantner's award-winning novel Ordinary Wolves. Author Seth Kantner talks about his life and writing. Links and related materials for Ordinary Wolves.